The times, they are appearing on Stevenage platform. Great news for my eyes. I can now see train information from my normal waiting spot on Platform 1. No, my eyesight hasn’t improved; they installed new displays along the platform so none of us have to squint into the distance any more. To be fair, Stevenage has undergone some big improvements in the time since I’ve been commuting through (and parking) here. After a very long wait, the day has arrived and I couldn’t let it pass without comment. 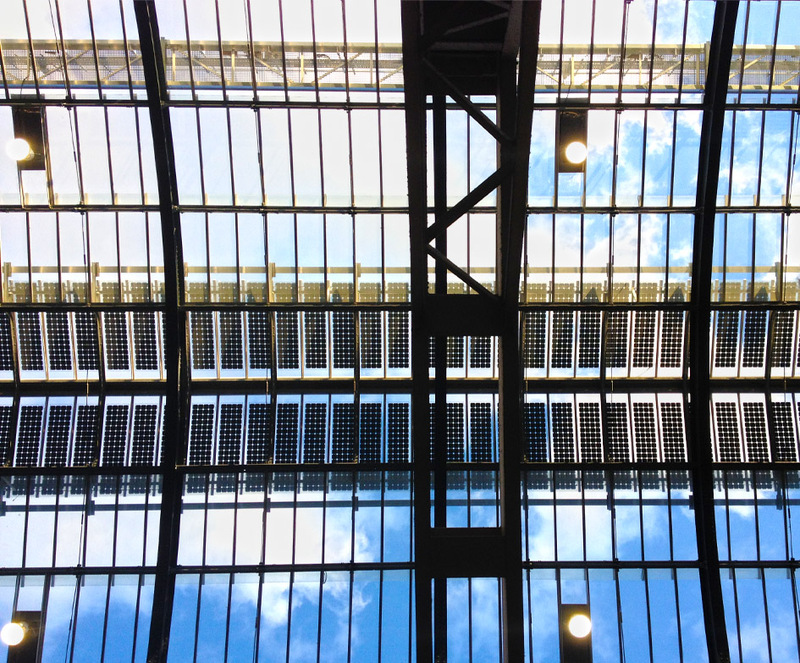 The covers are off the new ‘Western Departures Concourse’ and it looks great – a massive leap forward for King’s Cross. The weird thing was seeing people wandering about the place as though it had been like this all the time – made me feel a bit like I was late to the party. I did treat myself to a ride down the new escalator – and to be fair, it shaves a good 30 seconds of my commute to the Tube. Progress! 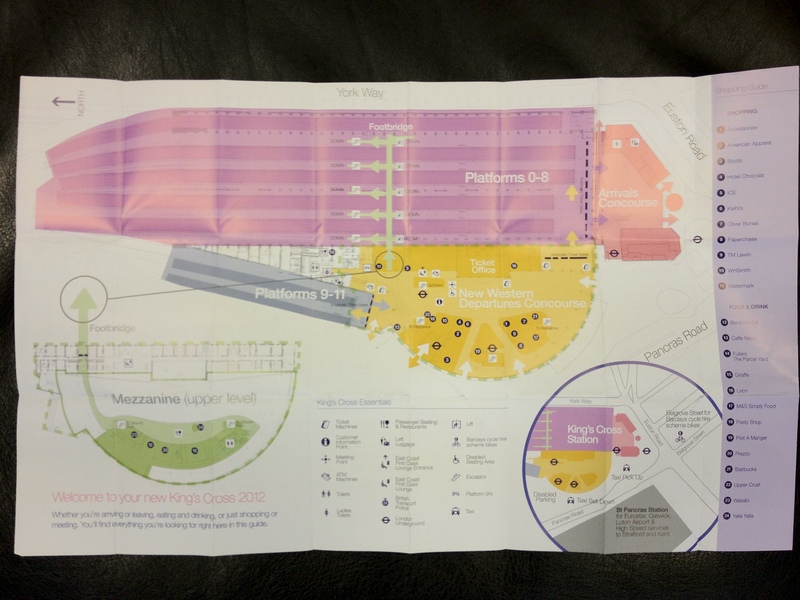 They were handing out maps so people could find their way around the new layout – saves them gathering up the 40 or so strays at the end of the day and shipping them home with a note. 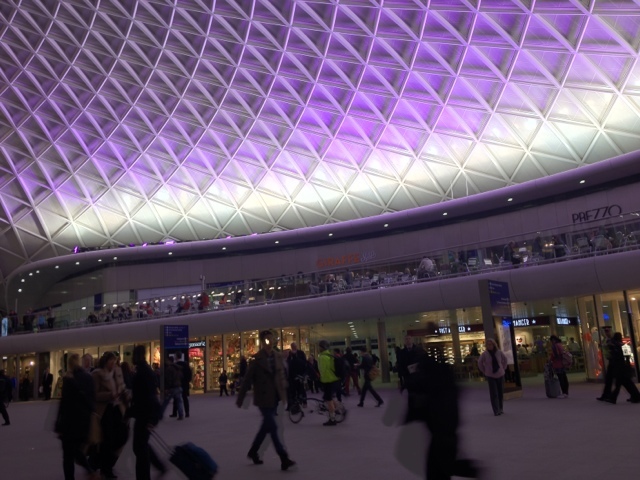 Here it is at night: concourse of the future! 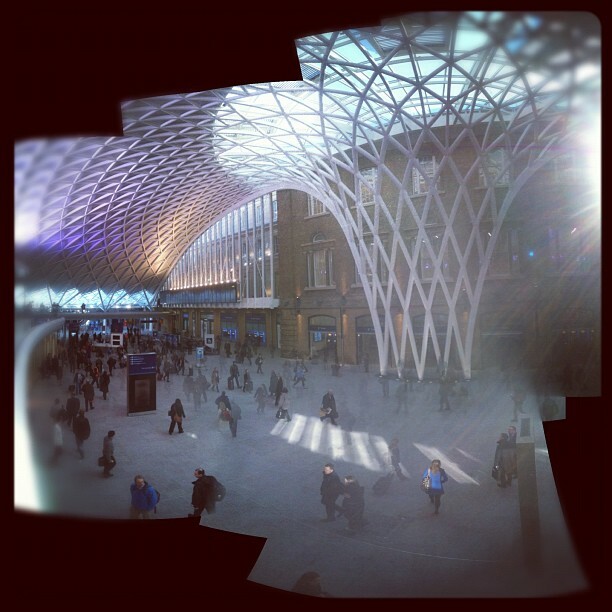 Platform 3 in all its panoramic glory. Click it to get the full effect. Do not feed the platform. Is this the start of an asphalt zoo? Possibly not. These are sitting at the north end of Platform 1 (I’m sounding like a station announcer now). Presumably someone in a hi-vis vest will come along and free these slabs and make them part of the existing platform. It’s not like there are slabs that are crumbling. There are a few older ones dotted about but that helps me position myself corredtly so I’m right in front of the doors when the train stops. Two steps to the left of the two brown slabs to be precise. Wow, this is better than Harry Potter. I’m at King’s Cross waiting for the platform announcement for my train home. On the big screen, the number comes up. O. Zero? That’s not an 8 is it?. Nope, that platform’s already taken. Platform zero? Not a 10 with a faulty display? Clearly not. As soon as the platform’s announced the waiting commuters stream over to the far side of the station. And there it is – just to the right of Platform 1, out of nowhere, Platform O. 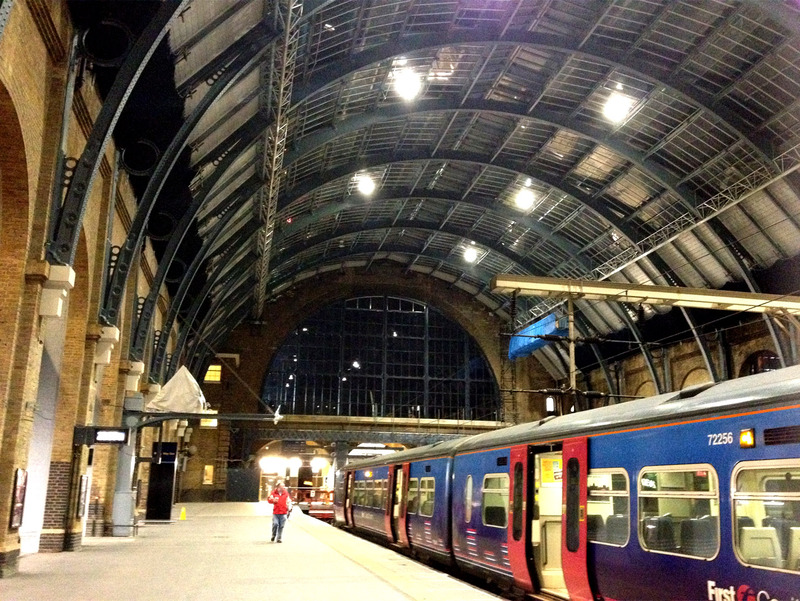 Now King’s Cross is also home to Platform 9¾ where Harry Potter and his chums take the train to Hogwarts. Never mind the fact that those scenes were filmed in the more cinematic St Pancras next door; for the benefit of tourists, they’ve set up a photo-op in a quiet corner. 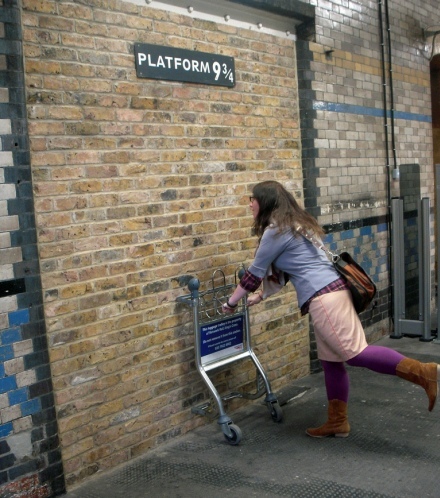 They have a wall with a baggage trolley embedded in it so that people can pose for a photo, looking as though they’re magically leaving the muggle world behind. Visual ratification of the above. Anyway, my immediate thought is, ‘is there room for a Platform Minus 1?’ Not really, or you’d be catching a train from the middle of York Way. Thankfully, the Sony Ericsson campaign seems to have lost interest and stopped following me. The billboard on the platform at Stevenage has been replaced by this one; apparently an ad for shadows. And why not. They’ve been under-represented for ages.